Uptiding for cod in Winter has become increasingly popular in Whitby. It offers anglers the chance to bait fish for cod a short steam from the harbour and can throw up some tremendous specimens. 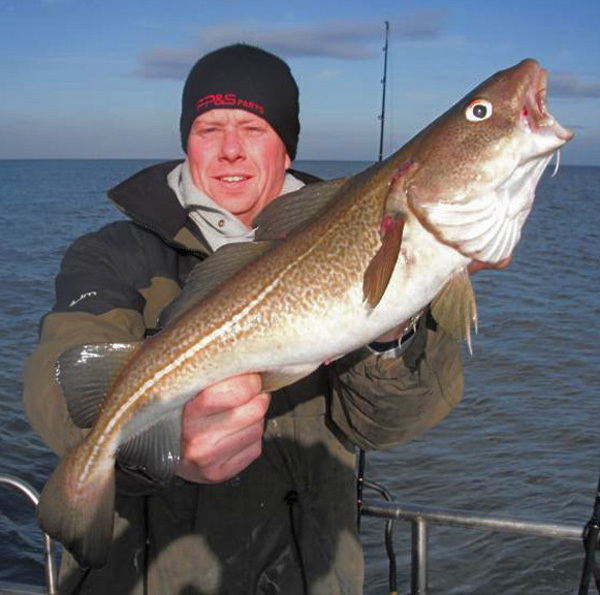 It is also becoming more popular with Whitby boat anglers looking to get out during the long Winter months. We have spent the past few years working hard on the uptiding grounds- plotting ledges, gulleys and other seabed features so that we have many reliable and productive patches within a short steam of each other. 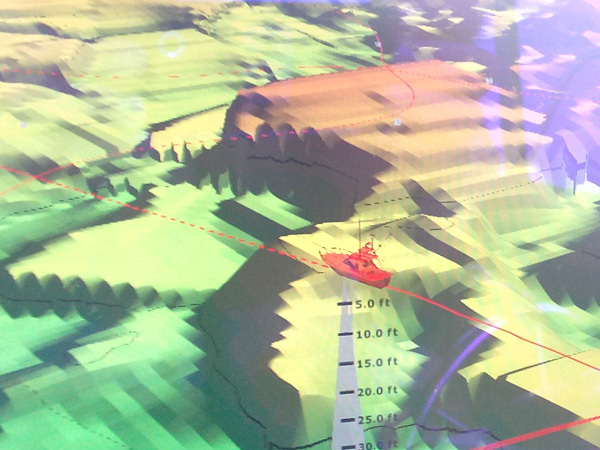 2015 will see Mistress expand on this as earlier this year we invested in a Maxsea 3D Plotter. All throughout 2015 I have added many new spots around the Whitby, Sandsend and Robin Hoods Bay areas which are perfectly suited to uptiding. The best thing about this is without this technology many of these spots will be overlooked by other angling vessels. Uptiding trips from Whitby are basically bait fishing for mainly cod on the inshore marks. Fish move into these grounds after the first Autumn Northerlies colour the water up and are eager to feed on the worms, crabs and crustaceans that are abundant there. Relatively light tackle is used with 5-6oz grip leads coupled with pennel rigs used to present the bait tight to the sea bed. While cod are the main species- our Whitby uptiding trips have also produced coalfish, pollock, dogfish, rays, wrasse and the occasional ling (up to 17lb!). 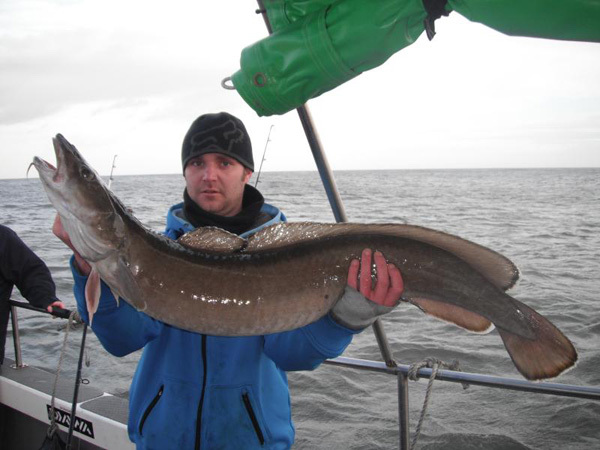 The best baits for uptiding in the Whitby area are black lug, fresh lug, crab cart, peeler crab, squid and mussel. The pennel rigs we use allow effective presentation on relatively large baits so make sure you have enough to last the day. If you need any bait such as frozen black lug, cart or squid then please let us know in advance of your trip and we can arrange this for you. Our uptiding hire tackle consists of the best Daiwa outfits- Saltist reels and Daiwa D & Z uptide rods. This is available for a small fee. As the fishing is only a short steam from harbour you are generally wetting a line within 30 minutes of leaving port and many have commented on the relaxed nature of the trips compared to the more vigorous wrecking trips of Summer. 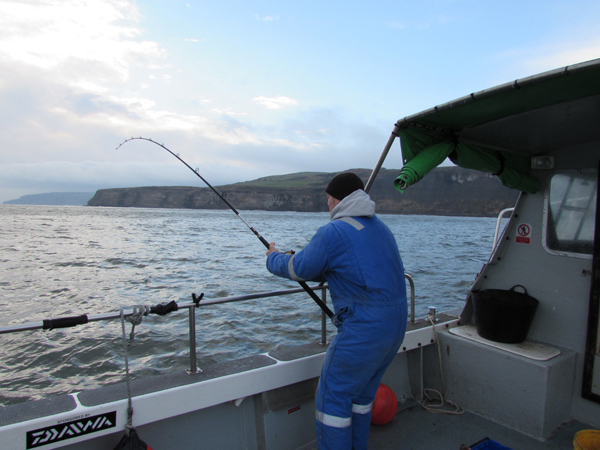 Whitby Uptiding on Mistress is also ideal for beginners and shore anglers wanting to try boat fishing for the first time as much of their existing terminal tackle can be used on the day. 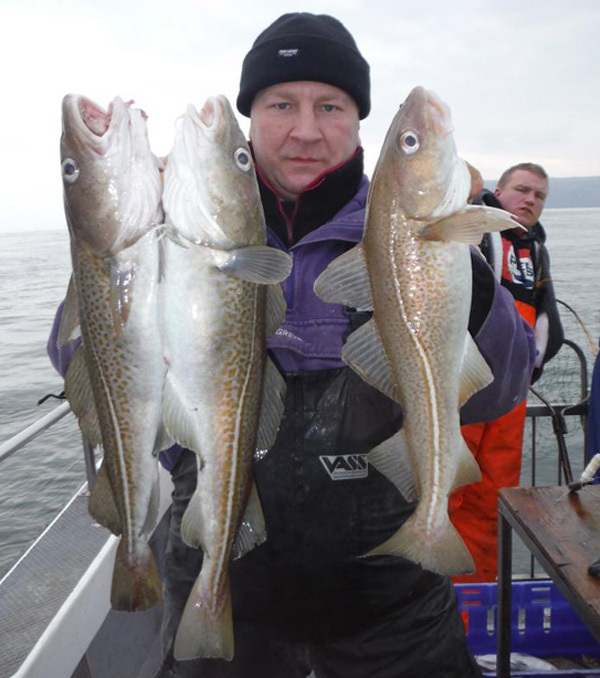 If you require any information on scheduled uptiding trips then please call skipper Rich Cope on 07977 436 903 or visit the Availability Page. Here at Mistress we are constantly trying to meet our customers needs while thinking outside of the box in angling terms. As such we have had successful evening uptiding trips out of Whitby for the past two seasons. Mistress holds a Category 2, 60 mile Code of Practice, which allows us to work in the dark-only a handful of boats and skippers hold this ticket in Whitby. While these trips are recommended for the more experienced angler- the results have been excellent and they also tend to fit in with peoples work hours- setting out at around 5.30pm and returning between 10 & 11pm. 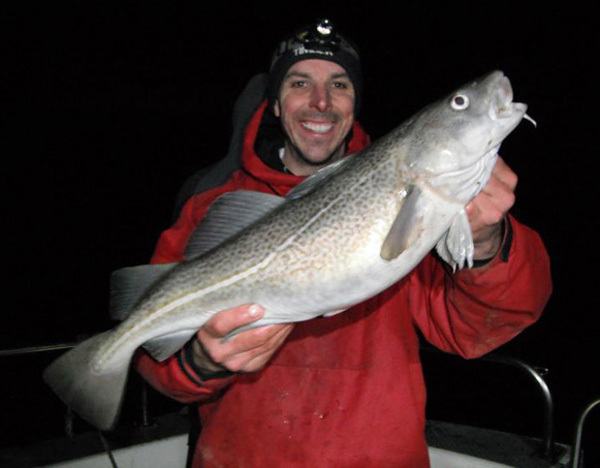 As shore anglers will know- inshore cod feed freely at night and it its often when the best specimens are caught. The tackle and bait remain the same as daytime but a headlight, glow sticks and back up torch are required. As these trips take a little more planning please call Rich on 07977 436 903 to find out when they are scheduled for. 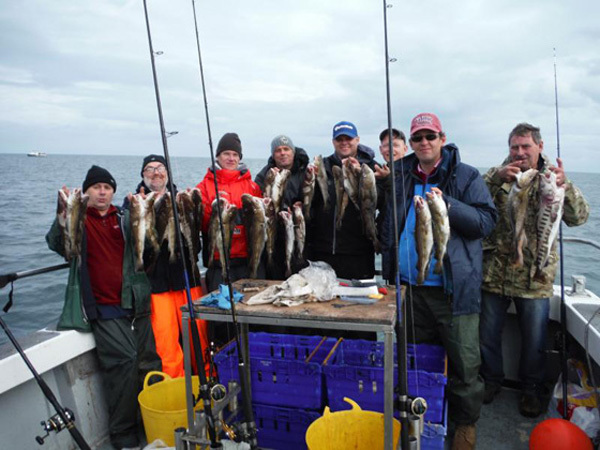 If you are interested in a Whitby uptiding trip at day or night and whether you are a beginner or seasoned sea angler- give us a call and we'll endeavour to meet your requirements.